Okay so everyone knows how to make a sandwich but this is just one of my summer favourites and I was making one for lunch so I thought I'd photograph the process. Cut the loaf in half and then slice open. Any good quality baguette or batard will work, this works nicely with a sourdough olive bread but I have a weakness for wholegrains so this is a soy and linseed with wheat germ. Spread one half of the loaf with the tapenade, then cut the feta and place on the tapenade. Sometimes we use marinated feta, but in this case you will wish to crumble the feta into the tapenade and eat the sandwich straight away as the oil makes the bread rather moist. Keep in mind this adds about 150 calories to the meal so should be avoided by the weight conscious. Pictured here is a smooth Danish feta which is less sharp and crumbly than a Greek feta; I find it far more suitable to sandwiches. Cut all the salad ingredients into small pieces so that they may be easily piled on the baguette. Make sure to sharpen your knife before dicing the tomatoes; here I have used Nectar Tomatoes rather than Cherry, they are baby Roma tomatoes which are sweet and well textured for sandwiches. Pile all the salad ingredients on top of the tapenade and feta then pile lettuce on to taste. Close the two halves of the bread and consume happily with a glass of sparkling mineral water. This is a perfect lunch meal, filling but healthy and full of fresh ingredients that don't leave you feeling "heavy" afterwards. This sandwich can easily be made the night before and holds up well as an office lunch, earning any number of jealous looks from co-workers. 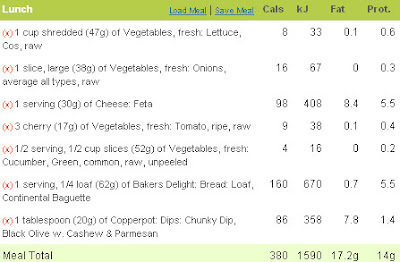 Some will know that I struggle to maintain my weight especially given my love of food and so I keep a regular food diary when maintaining my weight; I thought it may be of interest to others to get the nutritional totals for recipes where I have calculated them.